This traditional accent chair will provide your home with stunning style. 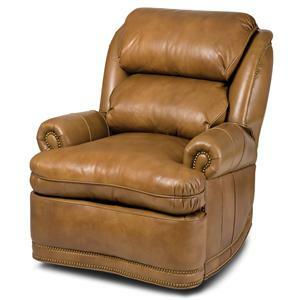 A great place to relax, this recliner features a padded seat and back cushion with a defined headrest. Wooden legs and nail head trim complete the style of the piece. This chair must be placed 19.5" from the wall in order full recline. Kick up your feet and relax with this reclining chair. This traditional recliner features a high leg style allowing this chair to have an authentic den room look without forgoing the comfort. 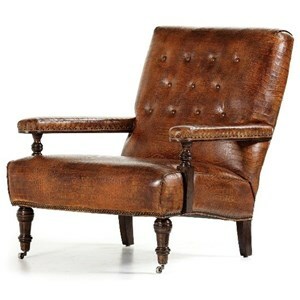 Nail head trim, rolled arms and wood feet complete the piece with elements of classic furniture style. 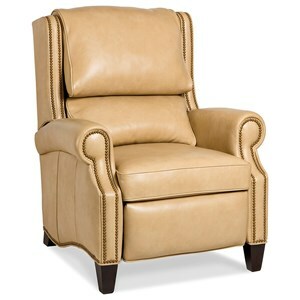 Blending traditional design with modern-day comfort, this wallhugger recliner is truly one-of-a-kind. 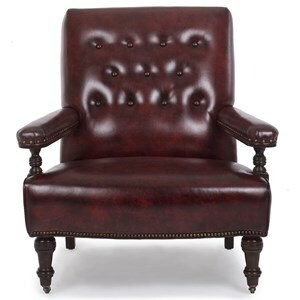 Framed by rolled arms and accented with nailhead trim, this chair brings soft elegance to a room. 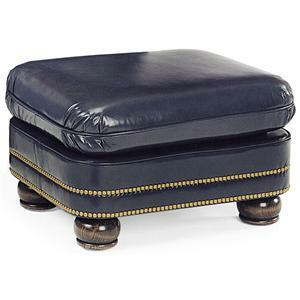 The ultimate living room accessory, this ottoman serves as the perfect footrest or extra seat. Its traditional style fits right into your formal living area, with nailhead trim and bun wood feet forming the base of the ottoman. 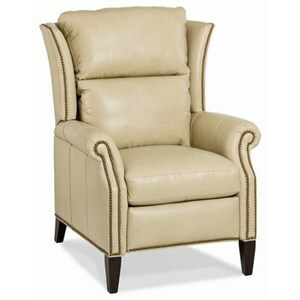 Pair with its matching upholstered chair for head-to-toe comfort and coordinating style. A bold take on the sleek forms of transitional design, this table boasts a textured nickel finish. 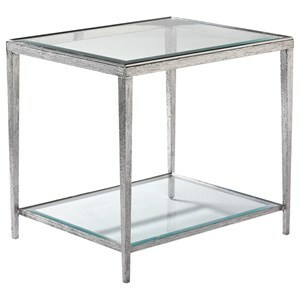 The clear glass table with its accent of bright metal are the perfect way to visually open the room and make it look larger and more specious, and the textural touches are a can't-miss detail. This sofa is a study in sleek, purposeful minimalism. The clean lines make this piece the perfect blank canvas. 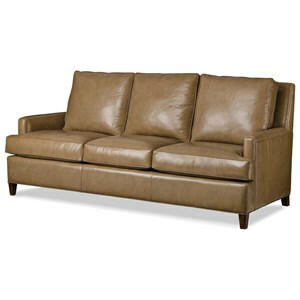 Customize the color of the sofa in any of our top grain leather choices. Then finish off your room scene with textiles and accent tables in complementing colors and textures. This couch is only the beginning of your dream room. This chair is a study in sleek, purposeful minimalism. The clean lines make this piece the perfect blank canvas. 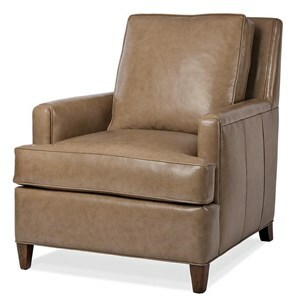 Customize the color of your arm chair in any of our top grain leather choices. Then finish off your room scene with textiles and accent tables in complementing colors and textures. This chair is only the beginning of your dream room. This decorative den chair will look perfect placed next to a fire or in a traditional den room. It features a tufted seat back, track arms and exposed wood legs. Front legs have casters. Compose a diverse and dynamic living room scene with eye-catching pieces like the stunning Rio table. 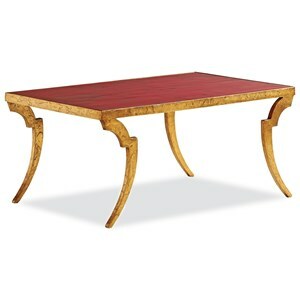 It's small on scale but makes a big impact with a vibrant, red lacquered table top and textured bronze base. Lacquered tables and chests, traditionally a staple of East Asian furniture design, prove to be excellent statement pieces in a contemporary or eclectic room. Deep in the Blue Ridge Mountains of North Carolina, Hancock & Moore started with a vision to manufacture the finest quality furniture that would remain beautiful for generations. This became reality in 1981, when Hancock & Moore was founded. That vision is displayed in each piece of Hancock & Moore furniture through the skillful touch of master craftsmen like Jimmy Moore. He grew up learning the skills of a carpenter, turning wood into artful creations. The desire to make distinctive furniture was an instilled value and the skill to make it was a gift. He spent hours carving, hand-sanding, sewing and upholstering handcrafted pieces. This, he decided, was the "ideal" way to build a unique brand of furniture. With the help of his fellow craftsmen, he transforms solid woods, soft leathers and fine fabrics into handcrafted furnishings no machine could ever match. Each piece of Hancock & Moore furniture bears the signatures of these artisans that created it. Whether it is crafting custom orders, or surveying production, his skilled vision for perfection remains. Jimmy Moore is one of the last to leave at the end of each work day, assuring that your handcrafted Hancock & Moore piece will result in furniture that you will enjoy and can be proud of for years to come.